Spektrum, JR, Hitec and modern Aitronics all use the same connector. Sometimes called a "Z" plug. Airtronics are often blue but are the same connector. The Male version of this plug is universal as it fits Futaba harnesses and receivers. If your flying something modern that's antother brand, nearly every one of these radios will use this plug. Exceptions are micro gear with white plugs. IMPORTANT NOTE: Assembled connectors with enclosed pins are gendered by the shell. A servo or battery end fits inside the RX (or mating plug) and is therefor Male. 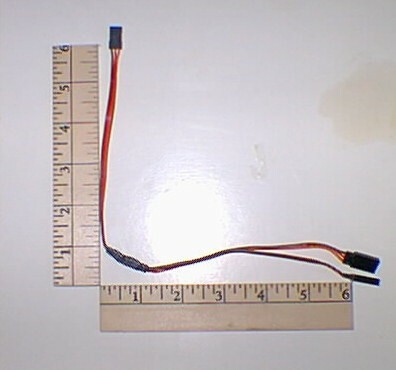 2 Wire battery female as found on the battery input lead of a switch harness or the end of a charge cord. This plug will accept the male connector on a stock RX battery pack. Quantity discounts below. Male Housing Shell only for JR/Hitec/Airtronics Z(new) Radio Connector (no pins), for use in building JR/Hitec/Airtronics Z (new) plugs. 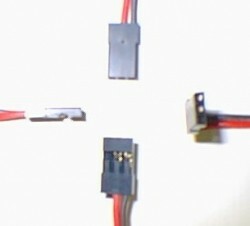 2 Wire battery male as found on the output lead of battery packs and the output of a switch that is intended to provide power to the RX. Quantity discounts below. 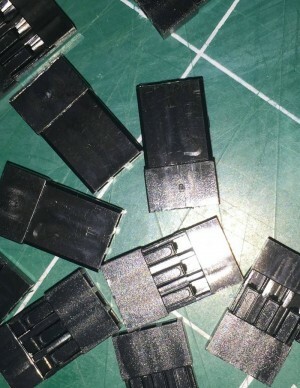 Female JR/Hitec/Airtronics Z(new) Radio Connector Pins only (no housings/shells), 10-Pack = 30 pins, for use with our special Hobby Pin Crimp Tool to make your own custom extensions, Y's etc. All pins are gold plated. Male JR/Hitec/Airtronics Z(new) Radio Connector Pins only (no housings/shells), 10-Pack = 30 pins, for use in building JR/Hitec/Airtronics Z (new) plugs. Female Housing Shell only for JR/Hitec/Airtronics Z(new) Radio Connector (no pins), for use with our special Hobby Pin Crimp Tool to make your own custom extensions, Y's etc. All pins are gold plated. 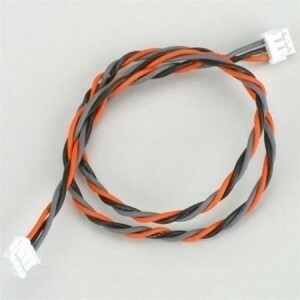 Use to replace damaged servo leads or to build your own custom harnesses. This connector plugs into the RX. 3 Wire female plug. Use to build your own harnesses or repair a servo input on an extesnsion or Y harness. A servo connector will plug into this connector and as an assembly, it's gendered as female. 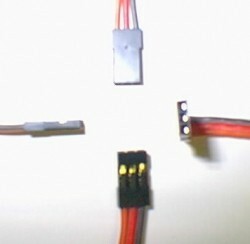 Micro Lite servo pigtail. Super light weight for Foamies and indoor models. This is a Male pigtail as is found on servos. Y harness. 10 to 12" long. Use to run two servos off one channel output on RX. Hitec/JR/Airtronics Z(new) connector style, 22 gauge heavy duty 60 strand wire, gold connector pins as always. Great part to use when there would be a little too much wire left over otherwise. 22 gauge wire so this is heavy duty. Gold contacts. Y harness. 10" long. Use to run two servos off one channel output on RX. 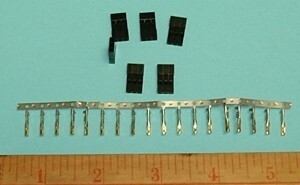 JR connector style, 26 gauge Standard duty wire, gold connector pins. Single Channel Block End Y Harness. 6" long. Use to run two servos off one Rx channel. 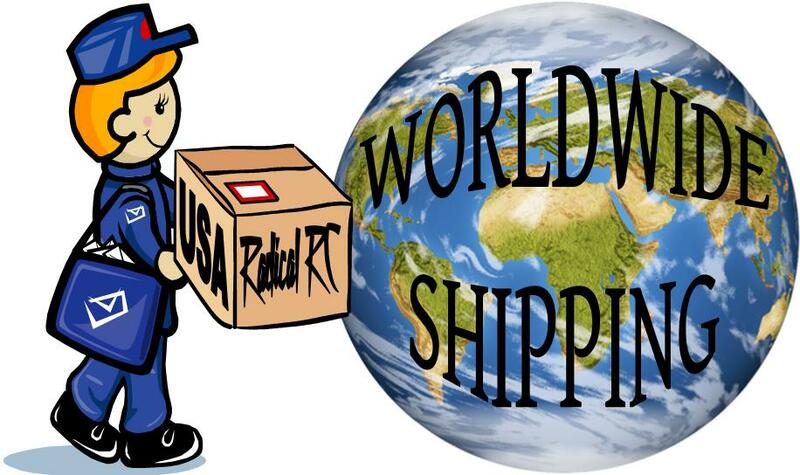 JR-universal male to universal block end female connector. A JR or Futaba J servo will plug into the block. 6" Servo Y with Reverse Buffer. Universal plugs. Works with all common modern Futaba, JR, Airtronics and Hitec type connectors. One servo center is trim pot adjustable for matching the up arm geometry. 1. Use in conjunction with an amp meter to test current to any one servo or between the battery pack and the entire system. 2. Use a combo of your amp meter and ESV to see how far your battery voltage is depressing at a given load. 3. Use in combination with our ESV to see what your voltage is while your system switch is on. A jumper plug is used to complete the connection when your doing volt only and no amp tests. Regular hobby battery test and charge cords (you probably already own) can be used to interact with this Y harness. Long leg Y harness. Need to drive 2 servos in a tail that are close to each other but far from the receiver? Here is a special part to solve some of those special problems. The Arms are fixed at 3" for all sizes. The Leg is available in variable length. Select leg length below. 22 gauge heavy duty wire. Note: JR harnesses on left and Futaba J on right. Long Arm Y harness. Great to drive 2 aileron or flap servos from the same channel in a large wing. Eliminates risk and weight of all those extra hidden connectors you'd have if you piece together a bunch of stock sizes. Here is a special part to solve some of those special problems. The Leg is 6" for all sizes. Arms (to plug servos into) are variable length. Length below is for each arm so 24" Long Arm Y has 48" spread. Size choice is length of each arm from y joint. Pick your size below. 22 gauge heavy duty wire. Note: JR harnesses on left and Futaba J on right. This Female plug will accept the common black JR TX battery plug. Use it to build your special charge or cycling harness. The JR T male plug is pictured to right for clairification only. Many views of the Female plug shown. LOOKING FOR A DEAL? All Futaba, JR-Hitec, Airtronics(old) connectors, male or female & two or three wire single end leads/pigtails are quantity of 5 for $8, regularly $2 each. 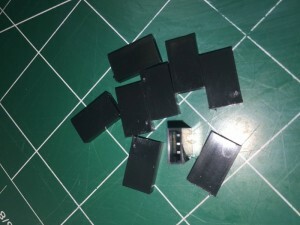 This block ended connector will accept any two Futaba/JR/Hitec/New Airtronics Servo ends (male ends). So, It's universal. 4 wires come out of this double female connector block, 1 for "+", 1 "-" battery power (that each servo will share) and one each signal wires (white and yellow) which are independant signal (or control) wires for your two servos. Great if you've got a two servo (flap or spoiler and aileron) wing for your sailplane and wish to have fewer wires to plug in at the field. Many other possible uses where fewer wires are desired to power and control 2 servos indpendantly. Other end of harness is tinned and ready to solder into your harness or project. 24 gauge (between standard and heavy duty) wire. Overall length about 5". Hint: Solder the two signal wires to one signal out put from your RX and both servos will work in unison. JR Heavy Duty 22ga Extension Harness 3", 6", 8", or 10"
3",6", 8", or 10" JR universal connector Style servo extension harness. 22 gauge heavy duty wire. JR 22ga Heavy Duty Extension Harness 18", 24", 30", 36" or 40"
JR Style Servo Extension Harness 18", 24", 30", 36" or 40". Photo shows 40" extension for reference. Micro Lite V harness. 4" long. Very liight weight for use on foamies and park flyers. Use to run two servos off one channel output on RX. JR-universal male to two Futaba J females connector style. 3 Pole/Wire Servo Micro Lite Servo V Harness 6"
Micro Lite V harness. 6" long. Very light weight for use on foamies and park flyers. Use to run two servos off one channel output on RX. Connectors are Futaba Females and universal JR Male. 3 Pole/Wire Micro Lite Extension Harness 3"
Micro Lite 3 Pole/Wire Extension harness. 3" long. Very light weight for use on foamies and park flyers! 30 gauge fine, lightweight wire. 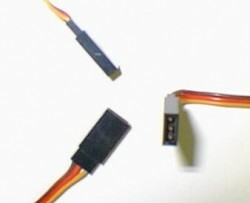 Universal connectors. 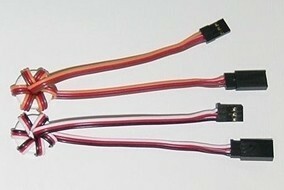 3 Pole/Wire Micro Lite Extension Harness 6"
Micro Lite 3 Pole/Wire Extension harness. 6" long. Very light weight for use on foamies and park flyers! 30 gauge fine, lightweight wire. Universal connectors. 3 Pole/Wire Micro Lite Extension Harness 10"
Micro Lite Extension harness, 10" long. Very light weight for use on foamies and park flyers! 30 gauge fine, lightweight wire. Universal connectors. Pack of JR compatible pins and shells. This kit contains enough parts to build 10 male battery or servo ends (fewer parts show in photo). All Pins Gold Plated. Available in multiples of 10 below. 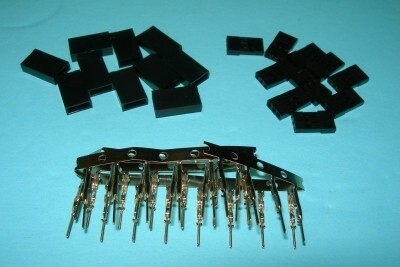 Use these Female pin kits with our special Hobby Pin Crimp Tool to make your own custom extensions, Y's etc. Build custom extensions to fit your setup exactly. The two arms of Y harnesses and RX's are Female. Wire/connector that you plug a battery connector into is female. Since the connector pins are covered by the connector jacket the unit is gendered as female. This kit contains enough parts to build 10 Female (fewer parts show in photo). All Pins are Gold Plated. Available in multiples of 10 below. Bulk pack of JR compatible pins and shells. This kit contains enough parts to build 50 male battery or servo ends. All pins are gold plated. Photo is sample for identification of parts only and not representative of quantity. Bulk pack of JR compatible pins and shells. This kit contains enough parts to build 50 female ends. All pins are gold plated. Photo is sample for identification of parts only and not representative of quantity. Bulk pack of JR compatible pins and shells. This kit contains enough parts to build 25 male battery or servo ends. All pins are gold plated. Bulk pack of JR compatible pins and shells. This kit contains enough parts to build 25 female ends. All pins are gold plated. Maxx Flying #1032 Rx Port Expander 3 Way. Expands your receiver port from one to three for additional accessories. Accepts any Futaba, JR, Airtronics New, Spektrum type "Z" connector. Rx end is universal and will work with all standard type RX's. JR/Spektrum Remote RX Extension 6"
Excellent quality, get that remote RX exactly where you want it without extra wire or splicing. Photo general example only. JR/Spektrum Remote RX Extension 12"
2 Wire battery female as found on the battery input lead of a switch harness or the end of a charge cord. This plug will accept the male connector on a stock RX battery pack. 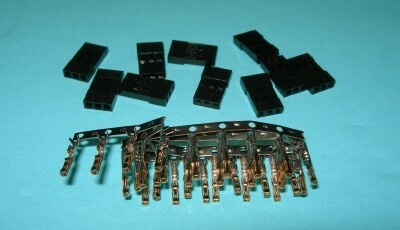 This item is a 26 gauge which is similar to what you find on many factory stock switch harnesses. I consider it light duty, use on charge cords or in smaller low servo count models. Twisted Wire. JR/Spektrum Remote RX Extension 27"